New property listing in River Creek II! This fairway condo is on second level with panoramic fairway and water views overlooking Sea Trail Maples Golf Course and is located ONLY 1.9 miles from Sunset Beach. Sunset Beach is an unspoiled barrier island beach with fine white sand and a wildlife sanctuary on the west end. This condo location is convenient for both golf and beach enthusiasts looking for a relaxing vacation in a resort setting. The condo is non-smoking and has two bedrooms/two full baths with 1 queen bed in the master bedroom and 1 double bed & 1 queen bed in the second bedroom. Each bedroom has a private adjoining bath. There are 3 flat panel televisions with a large screen in the living room, WIFI and a DVD player for the ultimate in entertainment enjoyment. The condo has beautiful vinyl plank wood-grain flooring and cozy furniture throughout! There are ceiling fans in every room and central heat & air allowing for any level of comfort. The condo has a laundry room with a full-sized washer/dryer. The floor plan is open and spacious with adjoining kitchen, dining and living areas. 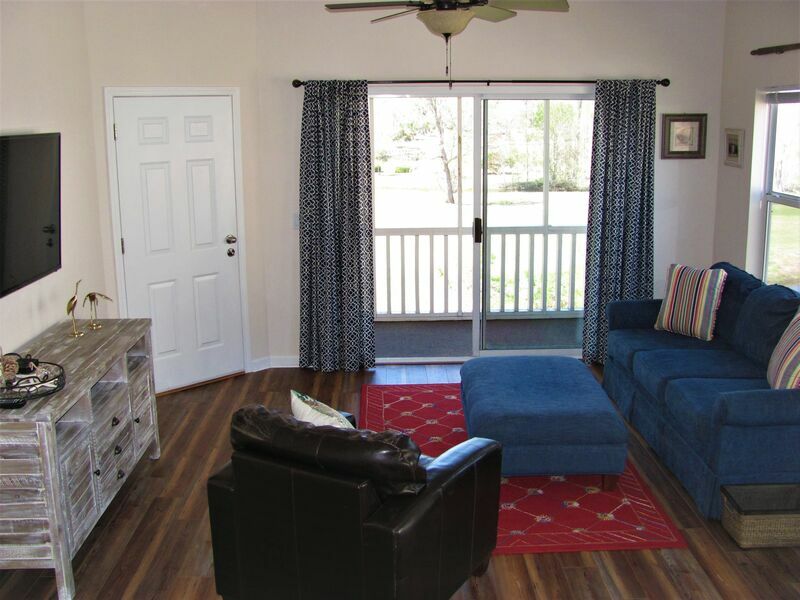 The main area of the condo has sliding glass doors that open to a large screened porch for outside seating to enjoy the coastal wildlife and scenic course views. The kitchen features a raised bar for additional dining space and a dining area with four chairs and a table. The kitchen area is equipped with a dishwasher, microwave, coffee maker, toaster, full-size refrigerator and range. The master bedroom is located in the front of the condo floor plan adjacent to the main area of the condo. The second bedroom has a private entry with and includes an additional seating area and kitchenette. The kitchenette area includes a sink, refrigerator and microwave. Complimentary linens, towels and departure cleaning service are included. The condo is located within the Sea Trail community which has a recreational facility available for guest use for an additional daily fee payable directly to the facility on-site - The Village Activity Center. The Village Activity Center provides indoor & outdoor pools, hot tub and sauna.